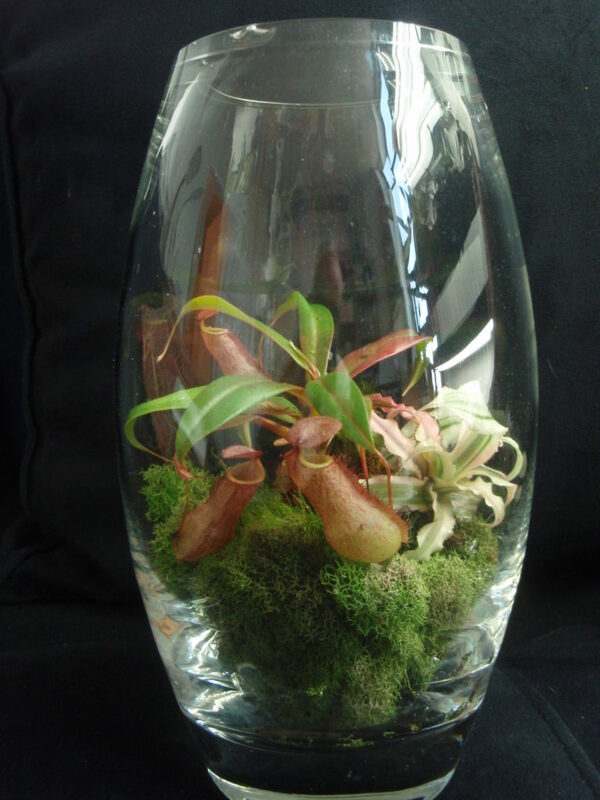 Nepenthes, the tropical pitcher plants can get to be large plants and are best suited to a greenhouse or large terrarium where they thrive in high humidity. However, there are a few hybrids (if you search for them) that are on the smaller side and these can make good houseplants (‘dwarf peacock’ is one that comes to mind). These smaller plants can be grown in a tapered glass vase or glass jar(see photo below) , but make sure you have some sort of lid to trap in the humidity which they need. Contrary to what you might think, not all nepenthee are from steamy jungles. Many are found higher up on cooler mountain-tops where it gets downright chilly at night. Unless you live far north,you may fare better with warmer growing ‘lowland ‘ species or hybrids than the cooler growing upland’ ones. 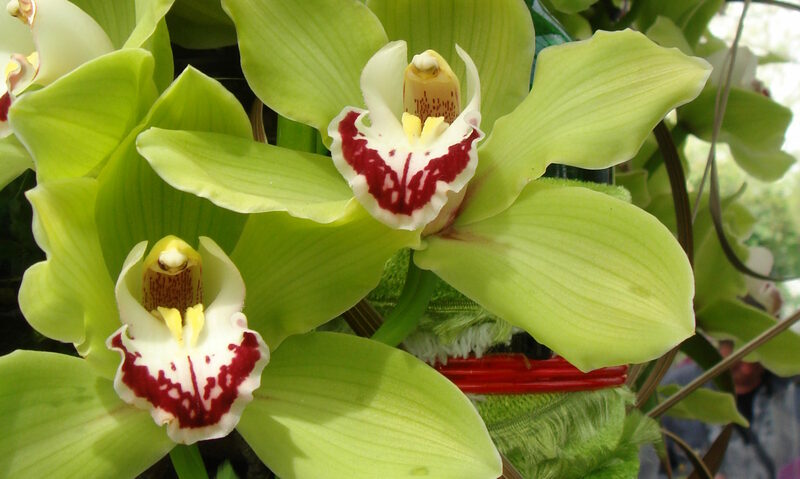 Either way, be sure to grow them in a peat-based mixed with good drainage, and fertilizer occasionally with dilute orchid fertilizer to get good results. And yes, you can feed them tiny bugs or insects as well. 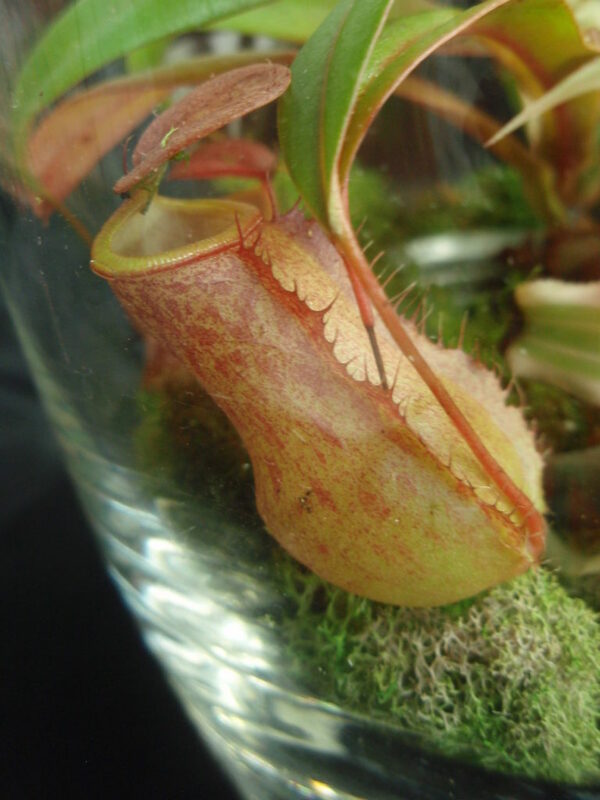 One thing we’ve found is that if nepenthes are unhappy, or the air too dry, they will stop making pitchers. It can take months to get restarted making pitchers, but once they settle in they should be fine. Vines can be clipped if the plants get too tall and leggy, at which point they should start producing basal rosettes. They need bright light, though not necessarily direct sun.The Nepenthes below is growing in a 2.5″ rose pot that is hidden by decorator moss. The crypanthus (bromeliad family) adds a dash of bright color and contrast to the reddish-green colors of the Nepenthes plant and pitchers. Nepenthes growing in 6 inch glass vase.